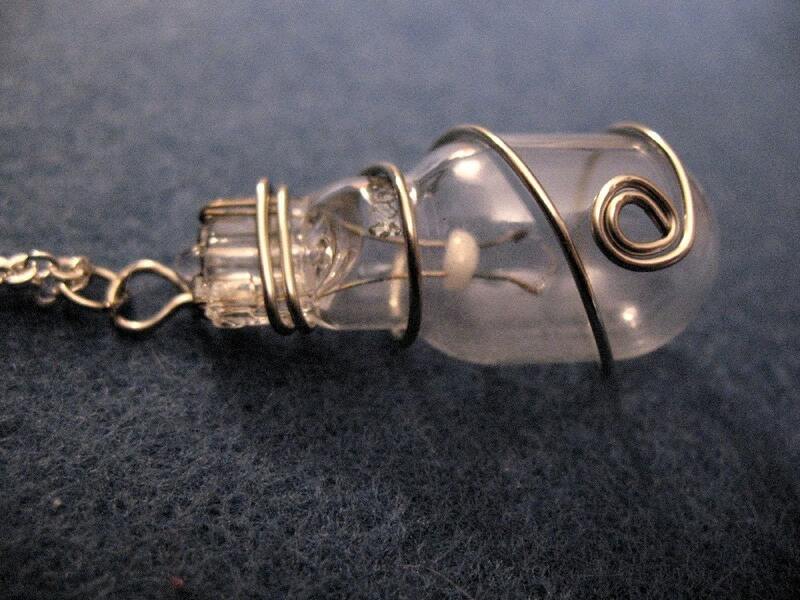 Craftster Community > JEWELRY AND TRINKETS > Trinkets and Jewelry: Completed Projects: Reconstructed (Moderators: I Sew Cute, Mistress Jennie) > Let there be light(bulbs)! The husband and I were browsing a local surplus store today where they have this display of jars and jars and jars of small lightbulbs. I was totally into the way the light and the glass looked, especially in such quantity. It inspired me to buy some lightbulbs of my very own and to play around with making jewelry incorporating them. This is my first successful effort. It's very simple, let me tell you, but I think the simplicity of the wire wrap works with the lightness of the glass. 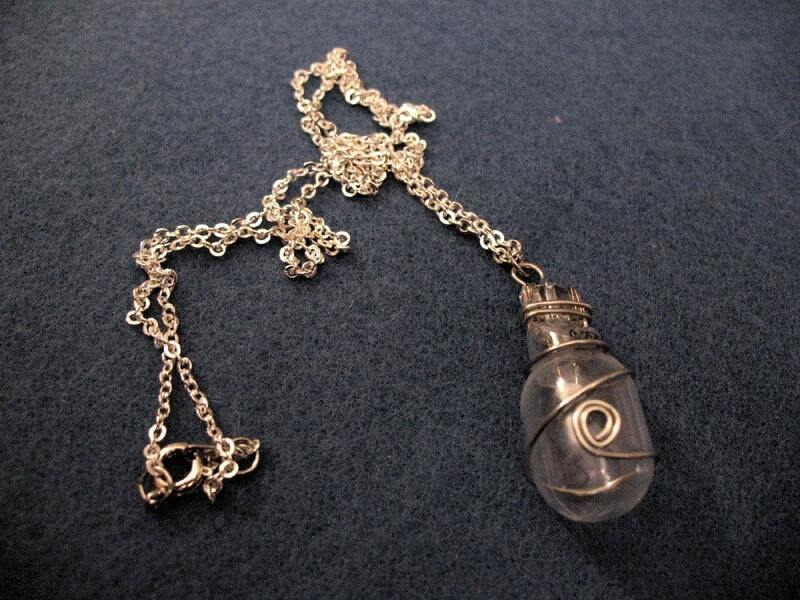 The glass, by the way, is a lot sturdier than you might imagine, especially with the wire wrap. Obviously, it won't stand up to extremely rough handling but it should be okay with any ordinary wear. The wire is sterling but the chain is only silver-plated. I might swap it out for a sterling chain but I only have the silver-plated on-hand. Re: Let there be light(bulbs)! Interested in doing personal swaps! I can knit, crochet and sew. wow, that's gorgeous. i would love to wear something like that! I really love it, unique idea. I would wear it all the time! that's so cool! i need to go to a hardware store, like, now. Ok, I have some lady friends who are lighting designers and I think they would love this! Personally, I find it beautiful. Ohh thats cool, and really unique! It looks great! I finally got a wist! one of the things i do to earn my bread is 'tech-ing' intelligent lighting - i finish the day with a lot of neat little bulbs and bits and fuses... you have completely inspired me to do Something Crafty with them. very frickin' cool - good job! so you just better get me one more round! ooooh! I just changed out some bulbs like that from my truck! !